I have talked several times about how much we LOVE Rudi's Organic Bakery breads in our house! They offer tasty breads for every diet and taste bud and my children love their sandwich every time it is made with Rudi's Organic Bakery breads! And I love making them with Rudi's because they use only the best organic ingredients and I know I can trust them with my children's precious bodies! At Rudi’s Organic Bakery, they are continuously striving to educate people the benefits of organic bread versus conventional bread. 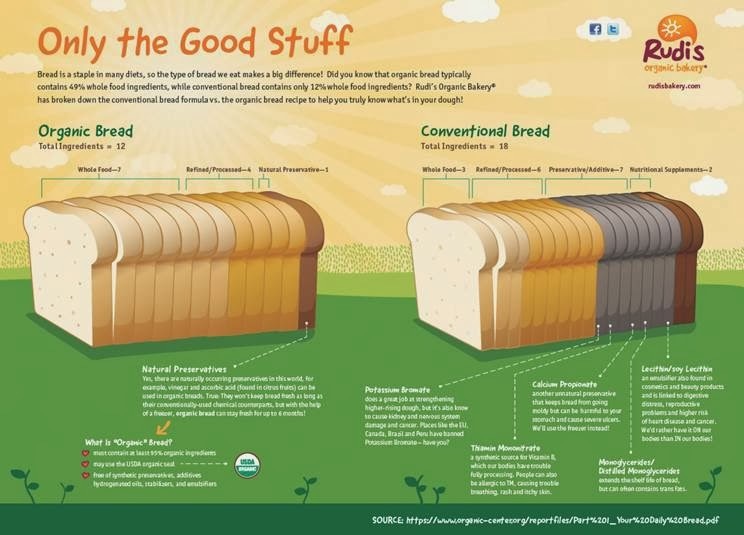 To help visualize the difference, they created a visually appealing and easy-to-understand infographic that will help shoppers decipher the differences between conventional and organic. As you can see, there are HUGE differences between conventional and organic bread and you can see why I choose organic bread for our family!! !